Premier of Nevis the Hon. Joseph Parry informed a packed audience that, Nevis had celebrated many firsts in the Caribbean. He made the statement at the Nevis International Feature Film Festival (NIF3) which was launched at Coconut Grove Restaurant on Sunday, May 3rd, 2009. The Film Festival is being hosted jointly by the Community Cohesion Foundation, the Nevis Cultural Development Foundation and the Nevis Community Development Department from May 3-8, 2009 at various venues throughout the island. “We have been the first in so many things. We had the first hotel in the Caribbean, with the Bath Hotel. Visitors as far as Europe came to Nevis to experience the springs at the Bath Hotel. “Nevis also has had the first golf course outside of Scotland and the island will soon be the first green island in the Caribbean with Geothermal. Although we will not be the first island outside of Europe to have a film Festival, we promise to be the best over the years,” said Mr. Parry. According to Premier Parry, the Nevis Film Festival, on the island’s calendar of events, would promote the Nevis Tourism product and would add diverse activities. The Premier also used the opportunity to commend the organizer and visionaries who conceptualized the idea of the festival - Mr. Abdul Ahmed and Minister of Culture and Deputy Premier, Hon. Hensley Daniel, who he said had brought a fresh air of modern thinking. “I am very pleased with the subjects of the movies. Immediately I thought of the young people who would be able to see the films with mind bending, informative and intellectual film topics. I am hoping that many people will be exposed to this new festival on Nevis,” commented Premier Parry. The Festival has given film enthusiasts and visitors the opportunity to vacation on the beautiful island of Nevis, while they viewed feature-length and short-films, animation, drama, documentary, experimental and hybrid new works by filmmakers from around the world. From the Opening Night’s festivities to the Green Carpet Awards Ceremony, this idyllic location, combined with a line-up of exceptional, jury-selected films and a star-studded guest list, would make the Nevis Film Festival an annual event not to be missed. The Nevis Film Festival will include movies from Belize, Venezuela, Cuba, Haiti, Jamaica and Costa Rica among others. 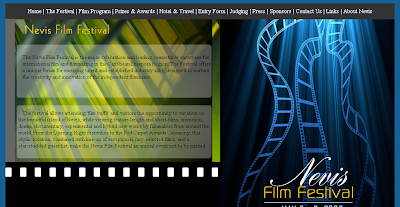 *Important to note that the organization also secured Nevis Film Festival dot com.